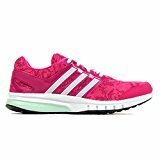 The adidas Galaxy Elite 2 Womens Running Trainers are perfect for ladies who enjoy their daily running sessions. Made with a super-breathable air mesh upper, which ensures your feet feel cool for as long as possible. This shoe also comes with ADIPRENE+ foam midsole which provides runners with an all round comfortable shoe. Finally, the added ADIWEAR rubber outsole makes for a very durable shoe with excellent grip, and of course the iconic 3-stripe design.